60×90 cm. The Sibley-Ahlquist bird classification system is based on recent DNA studies that use cladistics to reconstruct the evolutionary family tree, making the traditional system obsolete. This timely poster is based upon that system, making it one of the most concise ornithology references available. 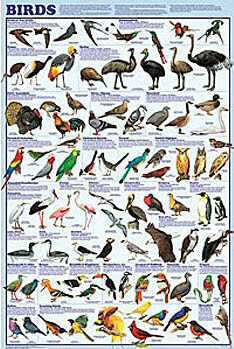 The poster explores all bird orders, introducing them by the common name of the species, followed by the name of the order. It also explains all of the classification changes, order by order. Representative species are shown and identified by both common and scientific names. Laminated.